I learned this first-hand when I practiced law full-time. I often represented nursing homes being sued for negligence in the death of a resident. You might not believe me, but most of the time people in nursing homes die of natural causes, not negligence. In litigation, my only opportunity to interact directly with the family of a deceased resident was at mediation. I had a knack for working things out at mediation and keeping the whole case out of court. My secret weapon? Apologizing, and meaning it. At mediation, we all started out together in one room. The family’s lawyer went first, explaining the ways they felt my client failed. Good plaintiff’s attorneys would spend at least a few minutes talking about the lost loved one, about the kind of life they lived and how much they meant to their family. Not-so-good lawyers would spend all of their time yelling angrily about how awful nursing homes are. Hear me on this, I never said these words for the purpose of manipulation. I always meant what I said. The sentiment was true and it was in my client’s best interest for this message to be communicated personally and clearly. It was in my client’s best interest for an apology to be offered. An apology has the power to soften the heart and open the mind. After I apologized, the family members were able to hear my client’s side of the story. They could hear me talk about the standard of care and how our staff had done their best to meet it. Can you think of a time you felt someone owed you an apology? Whether it was a friend, a family member, or a business, the lack of an apology probably hurt your relationship. Maybe you also know the power of offering an apology and receiving forgiveness. 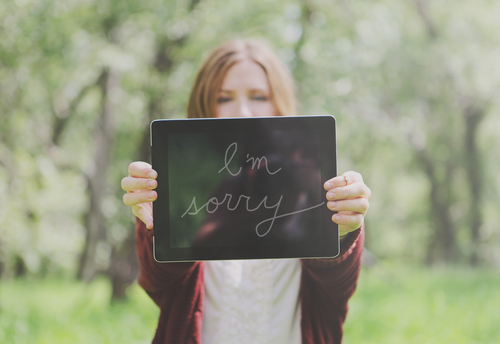 An apology works the same way in our spiritual life. Confession and repentance are Christiany, Churchy words for an apology. Instead of feeling like his “body wasted away through [his] groaning all day long,” when he apologized the Psalmist felt the freedom of God’s forgiveness. An apology has the power to do that, to deliver freedom. We can get caught up in our own mistakes. The shame we feel about our brokenness threatens to separate us from God (whether it’s a missed opportunity to show kindness, a parenting mistake, acting out in anger, an addiction, or any other kind of missed mark). Apologies are powerful because they require us to acknowledge our mistakes and they make us vulnerable. Offering an apology at mediation was going out on a limb. Those family members could have shouted down my apologies. They could have used my vulnerability as an opportunity to vent their grief. Steadfast love surrounds those who trust in the Lord. Unlike in my mediation example, when we apologize to God we aren’t trying to soften God’s heart or change God’s mind. Instead, it’s our own heart and mind at issue. When we apologize to God, we soften our own heart and open our own mind to how much God loves us. In return, we receive freedom from the guilt of our sin; we know that God’s steadfast love surrounds us. What about you? Can you think of a time an apology impacted your life? Does the idea of confession and repentance seem too Old Testament for you? Or have you experienced the power of an apology bringing you freedom from shame and regret? Tell me about it in the comments, in an e-mail, or on Facebook.